Subtopia: nomadic urbanism: future FEMA slugs? 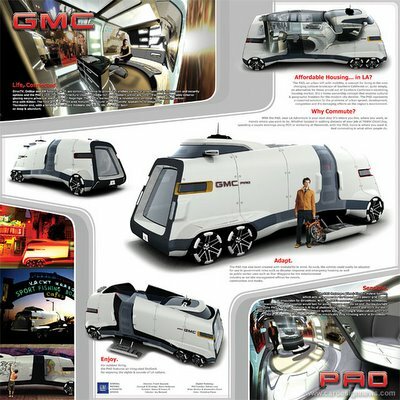 As part of the LA Auto Show “California Design Challenge,” the General Motors Advanced Design Group has submitted this design of the GMC PAD as a sort of reconceived mobile home solution to California's affordable housing crisis. It is the auto empire's response to the failure of our country's housing policy, which, they hope will ironically prompt a new type of migration to allow communities greater options for exploring the diversity of our culture. 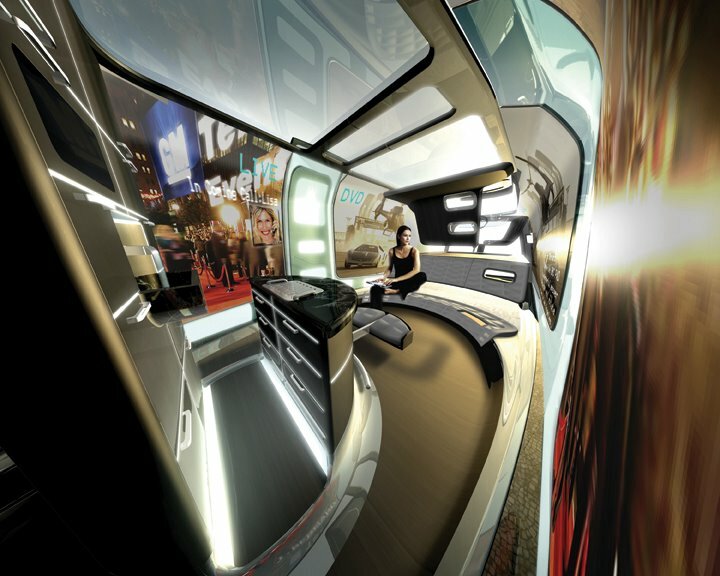 Like many others, they are gambling on the exclusivity of the real estate market to drive people into mobile homes for good, a strategy we obviously should be very concerned about. Well, needless to say, they have pulled out all of the rhetorical jargon we're so used to hearing about when it comes to contemporary mobility in architecture, urban nomadism, flexibility for a decentralized work force infrastructure, and the new paradigms of an information-based service economy. 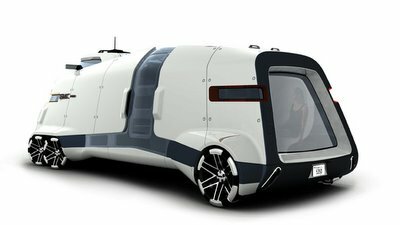 As usual, the auto is hailed as an ingenious solution for reclaiming self-sufficiency and spatial control through modularity and mobility over the cost burdens and fixed locale of trying to purchase an actual home. It's another good example of the distracting evolution of auto-space in this country, and how the vehicle continues to morph with such seductive appeal that it only masks the issue and pulls us further away from having a real debate about how to solve the crisis of affordable housing through actual housing, rather than through these types of vehicular architectural replacement. Even though the concept of the GMC PAD attempts to address this issue, I actually think it does less to solve the housing crisis and only compounds it by shifting our reliance from developing a responsible home-ownership model to another phase of expanded car-ownership. However, while I am weary of marketing mobility as a viable solution to the increasing impossibility of homeownership in this country, mobile architecture is perhaps the natural housing typology that emerges in backlash to the inequal stockpiles of real estate investment fortified behind an alarming increase in gated communities and suburban McMansion developments, new modernist castles or the fortresses of the elite, which clearly depicts the offset architectural translation of inequal wealth distribution in the U.S.. 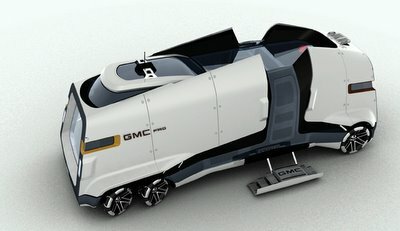 Though, the GMC team also envisions these futuristic slugs as architectural snail shells, having useful application to disaster response as a form of deployable emergency housing. Could you imagine if FEMA were giving these away to Katrina victims? I might be sold on them if that were the case, or if they were truly developed for such a context. Kinda looks like the truck in George Romero's new movie "land of the dead". that "dead reckoning" truck. Wow, that thing's a monster, I'll have to go check out the movie now. Looks like it came from the deep. Potentially, maybe we could develop "slug-like" traction technology for these vehicles, so they could, in a sense crawl around and attach themselves to coastal rock beds like barnacles. making them amphibious and truly nomadic. they could hold on in the face of a tsunami, or travel underwater, along the ocean floor, and come out the other side looking this "dead reckoning" truck. maybe the future FEMA slug has found a mate!